Clipping, it’s THAT time of year again. One of the things horse people who show and ride through the winter dislike the most is clipping their horses. There are many different “types” of clips that can be used. 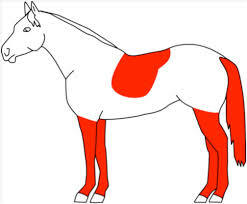 There are also fun patterns and symbols people like to use to clip their horses. Your choice in clip job should be determined by the amount of riding you plan on doing through the winter, location, and access to the right blankets for the regional weather. Here are some clipping types and what they are usually used for. There are two types of trace clip. One is called a high trace clip, and one is called a low trace clip. This type of clip is most used for people who ride in the winter, and their horse sweats some, but aren’t showing or riding with competition in mind. 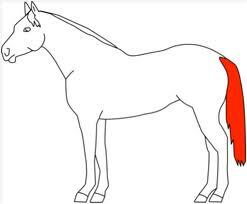 This type of clip is meant to allow the horse to cool off a little easier because it acts like a “vent” due to the clip being along the horses “underline” where there are some cooling points. When doing this clip, the clipper takes off the hair on the belly of the horse, the front of the chest and shoulder, and up the under-side of the neck. The legs, head, and topline are left with hair to protect the horse from the harsh wind, snow, and mud they may encounter. Horses with this clip don’t usually need as heavy of a blanket as a horse who has had more hair removed. The next level of clipping. It allows the rider to keep a horse in regular exercise while still being able to keep the horse warm over their back. Most of the time, horses who have been blanket clips are being worked, but not being competed seriously. When doing this clip, all of the underbelly is clipped, and then from the shoulder forward, all of the hair on the neck is clipped off. A small “blanket” area is left unclipped across the back (creating a natural “quarter sheet” of longer hair), the legs are left unclipped as well as the head. Some people will also clip the underside of the jaw. In this style clip the hair is removed from the entire body including the head and legs. 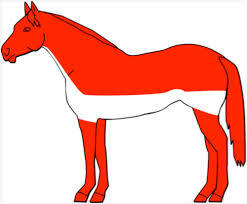 It is used mostly for horses that are from the northern areas of the US and are headed south for the winter. These horses have usually grown a rather thick winter coat that would be inappropriate for the warmer climate in the southern US. These horses will need to be heavily blanketed until their trek down south, or in lieu of their trek down south. More care is needed to make sure the horse is kept warm. The ears are thin and sensitive to the cold. It is important if a horse is fully clipped that he have access to some sort of shelter in the event there is cold wind, rain, ice, or snow. Lots of people enjoy also clipping patterns on their horses in the winter. These patterns can be anything from stars and hearts to specific designs depending on farm or “team”. Patterns can be made from stencils or free-hand. Whatever the reason, they can be a fun way to add some pizazz to your clip job. 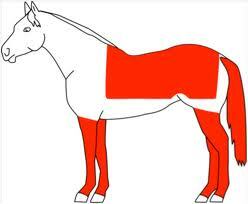 To do the pattern from stencil, you just need to apply the stencil where you would like to clip it onto the horse. You can use a non-toxic spray adhesive to attach it to the hair, or simple duct tape will work (though duct tape breaks down the stencil). It is best to use a set of smaller clippers or finisher clippers to clip in and around the stencil, clipping against the hair. Clipping your horse in the winter can be helpful for fitness and well-being for your horse. It saves time when cooling out, but can add time in warm-up. It is important if your horse is fully body clipped that you replace that missing hair with a blanket. When you ride, you will want to take that blanket off, but a good replacement in extreme temperatures is a quarter sheet. The idea of a quarter sheet is to keep your horses’ back warm. It fits either over the rider’s legs and covers the horse’s rump or can be used as a saddle pad that is long and goes over the rump. When you are ready to clip your horse, it is essential that you have your clippers in good working order as well as a clean horse to clip. Dirt will break down the integrity of the blades on your clippers as well as add undue stress on the motor of your clipping machine. Be sure to block out a couple of hours to clip your horse. Sometimes clippers will get hot and need a break and sometimes the horse doesn’t agree with your choice to clip. Giving yourself plenty of time will make the experience more pleasant for you and your horse. For more information on clipping be sure to check out the Pony Club News magazine, winter 2013. What is the Dressage Training Scale?